It can often be beneficial to abandon a territory to gain long term benefit. Sometimes losing a territory can help you gain another(one that works with your racial or power badge) or can give you the units you need to evict a peaty opponent. 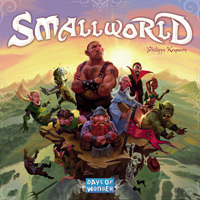 Small world was broken for me in a two-player game, where my girlfriend used a Diplomatic race. She blocked me up in one corner (I had only 3 regions) and declared that I cannot concquer her regions. I had plenty of tokens to spend, but I couldn’t, so I was forced to go in Decline with a fresh and strong race. This cost me a whole turn and I lost the game. Have this in mind next time you play – yes, you can always watch out for this special rule and avoid corners at all costs, but for us it’s much simpler just to play without Diplomatic in two-player games. Making use of the pillaging power to gain an extra point for each time you conquer a non-empty region you can play a particularly aggressive game. At the beginning of each turn when you collect your tokens to begin conquest, abandon all of your territory and take all of your tokens in hand, then find the weakest race and begin to charge headlong into their territory. Each territory you capture from that race will be worth 2 points at the end of the turn rather than 1. In addition to scoring 4, 6, or even 8 points a turn from your active race, you will still be scoring a few points from whatever race you have in decline. This will also cause your opponents to consolidate their defenses in fewer territories in order to defend against you and thus score fewer points per turn. Once all of your opponents are closed up in small, well defended areas and you have reaped many points from your pillaging, feel free to go into decline. So far, I’ve played Smallworld about a dozen times and from what I can tell, I am most successful when I can get out of step with everyone else as far as declining my races and picking new ones. Everyone generally plays a race 2 turns and then declines. This leads to maybe 3 races over the 10 turns. I try and decline early and often and then set myself up for a decline in round 9 so I can pick a new one in 10 and grab those final coins. I’ll never start with Amazons (unless they are available for a first draft pick) but mid game works great to conquer lots of spaces and rake in the coins! Once you’ve got a lot s turf and you see Merchant ANYTHING come up, grab them and double your coins for at least 1-2 rounds. I’ve pulled in up to 26 coins in a round before. That will do huge things for your final total. Throw in the Ghouls as a first round pick, which will allow you to have 2 races in decline, then the Merchant ability really becomes powerful in the late game. Basically Merchants work great as a follow up to a big conquest run, either attached to or immediately following a big army you have (had) that grabbed a lot of territories. For example if you did a dominating conquest run with the Amazons and followed it with say MERCHANT RATMEN? Cha-ching! Timing the exit of a race is a critical component to being successful in a game of Small World. Hanging on after a race has peaked or declining before a race has peaked is the mistake made most often by new players. From my experience it appears that 2 to 3 turns per race is a basic rule-of-thumb. However, that totally can depend on the races in play on the board. That’s what makes Small World great…the unpredictable! It’s really easy to look at the available races and powers, think one makes for a great combo,and then slap down coins (if necessary) to reach it. But I think one of the subtleties of this game is not just in having a good race/power combo, but in when it arrives on the board and how it will fare in relation to the competition. One small example: the “Flying” special power, even when paired with a race that is perhaps nothing special, can accomplish a lot on a crowded board near the end of the game. Getting those tokens out of the box is a nightmare. But it you make up some small strips of paper and lay them inside the partitions it makes life easier. Just tape one end in and leave the other poking out a bit. Then pull up the loose end to raise up all the tokens in that section. This alone has increased the playability of a great game. Flying Giants: Fly to those mountains and step down from them. You’ll have lots of easy points from that. Commando Elves: This are scary. They can cover a lot of ground, and they don’t lose momentum ever. Diplomatic Skeletons: They grow in numbers quickly. You’ll have lots of momentum all the time as you don’t have to focus on two fronts. Use that to your advantage. One of my gaming groups is a group of 6 people, which can sometimes limit which games hit the table when the group meets. Small World is probably one of my favourite games, so I like to introduce it to a lot of the new people I play games with. Since Small World usually only plays up to 5 players, the Necromancer Island expansion is a nice way to get in a 6 player game. I also like the fact that it gives the other players something else to watch out for, as the Necromancer can end, and win, the game early, if he manages to get all of his race tokens on the board at the end of his turn. This is not really a tip but did not know where to place it. There are some great resources out there for fan made races and powers. These are complete with full detail pdf sheets (or other file types). I have downloaded and printed off several of these ( print them onto sticker paper and place on craft board) and they have worked great. If you are concerned of being able to tell the difference you can use the blank power/race cards thst come with the game as a placeholder. The expansions give more of these. To add some additional decision making to the race/power combination, consider trying the following variant. At the beginning of the game, give each player 10 coins instead of 5. Set out 5 races (as normal) at the beginning of the game. Instead of pairing a power with each race, set the powers up separately (still 5 as normal, just not linked to a race). When you normally would choose a race/power combination, you now choose the race and power separately. The rules for selection are the same as before, (if you bypass something put a coin on it), but you’re buying the race and power separately. I have often found that choosing races that start with many chits (such as the Ratmen) have contributed to a more successful game. Start with smaller races and finish with races that have a bunch of race tokens available at the beginning of that race. A preferred preferred progression would be Amazons > Halflings > Ratmen. Different races and special powers become more or less powerful depending on the stage of the game. You’re going to want to decline your first race as fast as possible so you can start collecting points from two races, so it’s preferable if your first race expands quickly or has an ability that works while in decline. If either of your first two races have the Spirit power, then they’ll both want to fit this mold so you can get three races into play. A good middle-game race should be more versatile. You’ll usually want to be able to do strategic damage to other players, defend your borders, and maintain good point totals both while active and (later) while in decline. Races that acquire more race tokens over time often do well in this phase, since they’ll have more turns to take advantage of them. Usually you’ll take your final race during the last turn or two, which of course should be a quick cash-in to get as many points as possible under the wire. You won’t decline your last race, so how it performs in decline won’t matter. This tends to be the best time to take those abilities that give you straight victory points, whether as a one-time bonus or an ongoing effect. A variety of game race specific rule questions can come up, the easiest and fastest place to find answers is on the Small World forums where the devs will often post their official rulings for various circumstances. One particularly nasty combination I have seen is Diplomatic Ratmen, but it only works to full advantage if you grab it on the first turn. It’s effects are mitigated later in the game. Diplomatic causes other players to be unable to attack you on a turn that you did not attack them. If there are great swaths of the board unclaimed by anyone, then the sheer number of ratmen can quickly take a lot of territory. Which leads me to another tip, DEALING with someone using Diplomatic Ratmen. If your opponent gets these, the trick is to cordon them off as quickly as possible. This could mean cutting a swath across the middle of the map or surrounding them in a corner, but you want to halt their progress as quickly as possible. The ‘Power Badge + Race Banner’ is what makes Small World the; Fun, Strategic, and re-playable game that it is! So what could be better?! Now this isn’t new, and I didn’t originate the idea (even though the idea came to me prior to research). The next time you play; lay out the 5 Race Banners, and beside them place 2 instead of 1 Power Badge. We always stack the two Power Badges on top of each other in order to keep the second badge secret. So, in deciding which race/power to pick you only see the top Power Badge and must make a decision based on it alone. Once you have made your decision the second Power Badge is revealed and both Powers are in play with your active race. Also in figuring out the amount of race tokens you will receive; use the higher number of the two Power Badges. This has been great fun for our gaming group resulting in unique power combos, high scores, and mass destruction. When picking a race don’t spend too much for a race down in the order, unless it is just too good to pass up. Take one from the top and get all that extra coin that is sitting on it. Then be sure to go in decline at the right time. If you are unable to score 10+ points in a turn it’s time to go into decline. Make sure you recognize this before your turn. Otherwise, you could be stuck scoring 4-5 points on a turn instead of 10+ on your next turn.